Electrochemical reduction method was used to synthesize gamma-alumina (γ-Al2O3) nanoparticles (NPs) by optimizing different parameters like electrolysis time, current density, concentration of stabilizer or electrolyte, separation between two electrode and solvent. The synthesized γ-Al2O3 NPs were characterized by analytical techniques like XRD, SEM and EDX. Moreover the γ-Al2O3 NPs were explored for photocatalytic degradation of cationic pollutant Rhodamine B (RhB) and anionic pollutant Congo red (CR) in aqueous solution under sunlight. The degradation was 55.06% and 63.9% for RhB and CR respectively. The rate constant for RhB and CR was found to be pseudo first-order with values 0.170 and 0.208 h-1 respectively. Research on synthesis of γ-Al2O3 NPs has received considerable attention due to their broad range of application in ceramics, adsorbents, catalysts, composite materials and molecular separation [1-5]. γ-AlOOH, γ-Al2O3 and α-Al2O3, among which γ-Al2O3 is the most important phase because of its remarkable properties like high insulation, high strength, high rigidity and transparency. There are several possible routes to obtain nano sized Al2O3 like chemical vapor deposition in flame , spark plasma sintering , hydrothermal [8,9], sol-gel , laser ablation , mercury mediated technique  and electrochemical reduction . Variously nanostructured alumina have been synthesized such as mesoporous alumina [14,15], fiber, wires, belt, rod and tube [16-18]. Advantages of electrochemical reduction method are easy installation, time budget, high purity sample is obtained, easy isolation and no side product formation. The presence of organic waste created a serious problem to living being. The removal of organic pollutants from wastewater has been the matter of increasing interest in recent years. There are various methods for removal of RhB, CR and similar dyes from water system like coagulation, chemical oxidation, liquid-liquid extraction, electrochemical treatment, adsorption and photocatalysis [19-24]. All chemicals were of AR grade and purchased from Merck chemical suppliers. Distilled water was used as solvent. Where E represents the electrolyte. The crystal phase and crystallinity were determined by powder X-ray diffractometer with Cu-Kα radiation (λ=1.5406 Å) recorded using Bruker D8 Advance. The surface morphology of γ-Al2O3 NPs was studied by scanning electron microscopy carried out with JEOL-LED 2300 (LA) equipment. 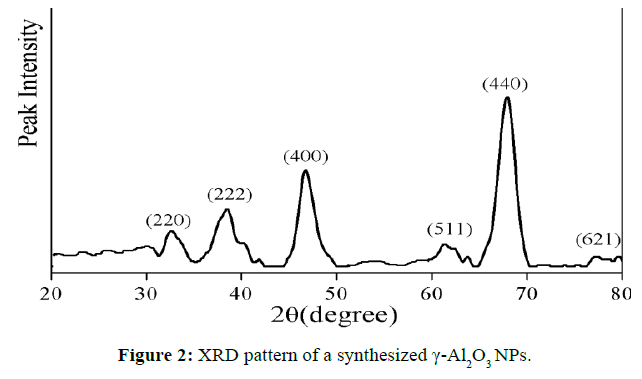 The chemical composition of the γ-Al2O3 NPs was determined by using an energy dispersive X-ray spectroscopy (EDS; combined spectrometer/SEM instrument) A UVvis spectrophotometer (Shimadzu 1800) was used to determine the photocatalytic activities of the γ-Al2O3 NPs in the degradation of RhB and CR dye. The photocatalytic activities of the γ-Al2O3 NPs under sunlight irradiation were determined by measuring the photo degradation of RhB and CR aqueous solution (25 mg/lit). RhB and CR dyes have different molecular structure and different functional group (Figure 1). The RhB is a cationic dye with a methyl nitride group [(C2H5)2N+] and the CR is an anionic azo dye with sulfonate group (SO3-). For the reaction 100 mg of γ-Al2O3 NPs was dispersed in 250 mL 25 mg/lit dye solution in pyrex beaker, to establish the absorption/desorption equilibrium, Teflon coated magnetic stirrer used to stirred reaction mixture magnetically. After equilibrium was established, the suspension was exposed to sunlight with constant stirring. During the reaction 5 mL solution was withdrawn at specific time intervals and centrifuged. The absorbance maxima for RhB and CR were determined at 553 and 497 nm respectively using UV-vis spectrophotometer. Figure 1: Structure of RhB (a) and CR (b). X-ray diffraction analysis (XRD) was used to confirm the crystal phase, purity and average grain size of NPs. (Figure 2) shows the XRD pattern of γ-Al2O3 NPs. The peaks that appeared at 2θ values of 32.60°, 38.49°, 46.71°, 56.76°, 61.37°, 67.94° and 77.29° correspond to the characteristic reflection of (220), (222), (400), (422), (511), (440) and (621) planes of the cubic γ-Al2O3 structure well-coordinated with JCPDS card no. 02-1420. The average grain of the γ-Al2O3 NPs is 18.15 nm. Figure 2: XRD pattern of a synthesized γ-Al2O3 NPs. Figure 3a and 3b are SEM micrograph and EDX spectrum of γ-Al2O3 NPs respectively. SEM image shows mesoporous structure of nanoparticles. EDX spectrum shows absence of elemental impurities in the prepared γ-Al2O3 NPs. Figure 3: (a) SEM image of synthesized γ-Al2O3 NPs (b) EDX spectrum of synthesized γ-Al2O3 NPs. Photodegradation of RhB and CR using γ-Al2O3 NPs under sunlight irradiation was studied. The decrease in absorbance values in presence of γ-Al2O3 NPs with irradiation time, were observed for RhB and CR as indicated in Figure 4a and 4b. It clearly revealed the efficient degradation of these dyes. The color of dyes solution faded within 6 h in sunlight irradiation in presence of γ-Al2O3 NPs. The % degradation was found to be 55.06% and 63.9% for RhB and CR respectively shown in Figure 5a. The rate of photocatalytic degradation for RhB (0.170 h-1) was lower than CR (0.208 h-1) exposed in sunlight (Figure 5b). Figure 4: UV-vis absorption spectra of RhB (a) and CR (b) aqueous solution in the presence of γ-Al2O3 NPs at different irradiation times. Figure 5: Percentage (%) dye degradation and pseudo first order kinetics respectively. In this study γ-Al2O3 NPs were successfully synthesized by an electrochemical reduction method. The XRD pattern revealed that formation of cubic structure γ-Al2O3 NPs. The average grain size of synthesized NPs is 18.15 nm SEM image indicate mesoporous nature of NPs. EDX spectrum represent only Al and O that is complete removal of electrolyte. The prepared γ-Al2O3 NPs were used as a photocatalyst for the degradation of RhB and CR dye under sunlight irradiation. The higher degradation of CR was recorded 63.9% as compared to RhB dye. The rate constant for RhB and CR was found to be pseudo first-order with values 0.170 and 0.208 h-1 respectively. Trimm DL,StanislausA (1986)The control of pore size in alumina catalyst supports: A review.ApplCatal 21: 215-238. SterteJ, OtterstedtJE (1986)A study on the preparation and properties offibrillarboehmite.Mat Res Bull 21: 1159-1166. Misra C (1986) Industrial Alumina Chemicals, ACS Monograph 184, American Chemical Society, Washington, DC. Philipse AP, Nechifor AM, Pathmamanoharan C (1994) Isotropic and birefringent dispersions of surface modified silica rods with a boehmite-needle core. Langmuir 10: 4451-4458. Goodboy KP, Dowing KC, Hart LD, Lense E (1990) Alumina ChemicalsScience and Technology Handbook. The American Ceramic Society Inc., Westervill OH, p: 93. JagminasA, Kuzmarskyte J, Malferrari L, Cuffiani M (2007) A new route of alumina template modification into dense-packed fibrilous material. Mater Lett 61: 2896-2899. KimBN, Hiraga K, Morita K, Yoshida H, Miyazaki T, et al. (2009) Microstructure and optical properties of transparent alumina.Acta Mater 57: 1319-1326. Qu LH, He CQ, Yang Y, He Y, Liu Z (2005) Hydrothermal synthesis of alumina nanotubes templated by anionic surfactant.Mater Lett 59: 4034-4037. KatamreddyR, Inman R, Jursich G, Soulet A, Takoudis C(2006) ALD and characterization of aluminum oxide deposited on Si (100) using tris(diethylamino) aluminum and water vapor.J Electro ChemSoc 153: C701-C706. Mirijalili F, Hasmaliza M, Abdullah LC (2010)Size-controlled synthesis of nano α-alumina particles through the sol-gel method.Ceram Int36: 1253-1257. Yatsui K, Yukawa T, Grigoriu C, Hirai M, Jiang W (2000) Synthesis of ultrafine γ-Al2O3 powders by pulsed laser ablation.JNanopart Res 2: 75-83. Guo B, Yim H, Luo ZP (2009) Formation of alumina nanofibers in carbon-containing coflow laminar diffusion flames.J Aerosol Sci 40: 379-384. PathaniaD, KatwalR, Kaur H (2016) Enhanced photocatalytic activity of electrochemically synthesized aluminum oxide nanoparticles.Int J Minerals Metallurgy and Materials 23: 358-371. Niesz K, Yang P, Somorjai GA (2005) Sol-gel synthesis of ordered mesoporous alumina. ChemComm1986-1987. Bagshaw SA, Pinnavaia TJ (1996) Mesoporousalumina molecular sieves.AngewChem35: 1102-1105. Peng XS, Zhang LD, Meng GW, Wang XF, Wang YW, et al. (2002) Photoluminescence and Infrared Properties of α-Al2O3 Nanowires and Nanobelts.J PhysChem B 106: 11163-11167. Hou H, Xie Y, Yang Q, Guo Q, Tan C (2005) Preparation and characterization of γ-AlOOHnanotudes and nanorods.Nanotechnol 16: 741-745. Teoh GL, Liew KY, Mahmood WAK (2007)Synthesis and characterization of sol-gel alumina nanofibers.J Sol-Gel SciTechnol 44: 177-186. Katwal R, Kaur H, Sharma G, NaushadM, Pathania D(2015)Electrochemical synthesized copper oxide nanoparticles for enhanced photocatalytic and antimicrobial activity.J IndEngChem 31: 173-184. Mohan D, Singh KP, Singh G, Kumar K (2002)Removal of dyes from wastewater using flyash a low-cost adsorbent.IndEngChem Res 41: 3688-3695. Oguz E, Keskinler B (2007) Comparison among O3 PAC adsorption O3/HCO3 O3/H2O2 and O3/PAC processes for the removal of Bomaplex Red CR-L dye from aqueous solution.Dyes Pigm 74: 329-334. Wang S, Booyjoo A, Choueib A, Zhu Z H (2005)Removal of dyes from aqueous solution using fly ash and red mud.Water Res 39: 129-138. Kim T, Park C, Yang J, Kim S (2004)Comparsion of disperse and reactive dye removals by chemical coagulation and Fenton oxidation.J Hazard Mater 112: 95-103. Gupta VK, Agarwal S, Pathania D, Kothiyal NC, Sharma G (2013)Use of pectin-thorium(IV) tungstomolybdatenanocomposite for photocatalytic degradation of methylene blue.CarbohydrPolym 96: 277-283.